One of my favorite things to do in Turkey is go down to the main otogar (bus station), ask around for buses to interesting destinations, and hop on. The station itself is no great shakes architecturally or anything, but I love the hustle and bustle and the feeling that a whole country’s worth of options is open to me. That sense of possibility and movement draws me to transit hubs of all kinds, from Grand Central Station to the dustiest little village bus stop. 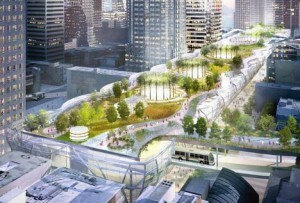 But one I could never work up any love for was my hometown of San Francisco’s Transbay Terminal. When I go back for a visit in the future, though, it might be a whole different story.